The San Francisco Bay Living Shorelines: Near-shore Linkages Project is a multi-objective habitat restoration pilot project. This experimental restoration project allows us to learn more about best locations and techniques for native oyster and eelgrass restoration, to gather information about fish, invertebrate, and bird use of the reefs, and to assess whether the reefs can provide physical benefits such as reducing wave action and protecting adjacent shorelines. 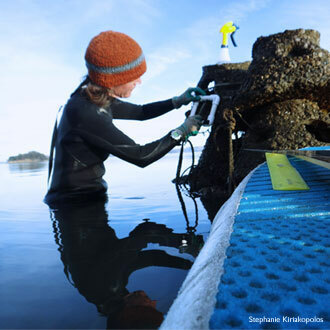 Oyster and eelgrass reefs were constructed at two sites in San Francisco Bay in July and August 2012 (larger and small experiment at the San Rafael Shoreline, and small experiment at Hayward near the Eden Landing Ecological Reserve). General Concept: Living Shorelines projects use a suite of bank stabilization and habitat restoration techniques to reinforce the shoreline, minimize coastal erosion, and maintain coastal processes while protecting, restoring, enhancing, and creating natural habitat for fish and aquatic plants and wildlife. The term “Living Shorelines” was coined because these techniques provide living space for estuarine and coastal organisms by the strategic placement of native vegetation, natural materials, and reinforcing rock or shell for native shellfish settlement. The approach has been implemented primarily on the East and Gulf Coasts, where it enhances habitat values and increases connectivity of wetlands and deeper intertidal and subtidal lands, while providing a measure of shoreline protection. Living Shorelines in San Francisco Bay: Living Shorelines projects are new to SF Bay, where pilot restoration work on eelgrass and oyster reefs has recently led to recommendations for additional experimental testing of techniques and gradual scaling up to larger projects. The 2010 San Francisco Bay Subtidal Habitat Goals Report recommended that the next generation of projects considers the possibility of integrating multiple habitat types to improve linkages among habitats and promote potential synergistic effects of habitat features on each other as well as on associated fauna. Such habitat features, if scaled up slightly beyond previous efforts, could positively influence physical processes (such as sediment erosion and accretion) that affect shoreline configuration.